Hey, ever heard of an energy-boosting multivitamin with fermented ingredients? Presenting New Chapter Perfect Energy Multivitamin. If you’re keen on buying a hybrid energy booster and multivitamin, this is one you should consider. Fermented ingredients. Multivitamin with excellent bioavailability. ICS Certification. Meets highest standards for organic products. Expensive. One 72-tablet bottle (24 servings) costs $49.88. Other ingredients: Culture media (organic soy flour, organic gum acacia, organic Saccharomyces cerevisiae, organic maltodextrin, organic orange peel powder, organic carrot powder, organic alfalfa powder, organic molasses, papain [deactivated], bromelain [deactivated], lactic acid bacteria [L. acidophilus, B. bifidum, L. rhamnosus] and organic safflower oil), organic maltodextrin, organic gum acacia, silicon dioxide, maltodextrin, lac resin, carnuba wax, magnesium dioxide and magnesium carbonate. Suggested Use: Three tablets daily. Can be taken anytime, even on an empty stomach. If you can’t decide between a multivitamin and energy booster, you may be better off choosing a multivitamin which will help perk you up. Hard evidence: EFX Sports VitaDrive. If this bodybuilding supplement’s insane B vitamin levels don’t perk you up, nothing will. It dethroned Beverly International Super Pak in terms of B vitamin content, but that doesn’t mean the latter is a slouch. We think its incredible 10,000 percent of the daily value for vitamin B1 will give you the jolt you need. Now, New Chapter Perfect Energy Multivitamin’s B vitamin levels pale in comparison to both of the aforementioned products. However, one look at the ingredients list tells us it’s the most comprehensive among the three. New Chapter Perfect Energy Multivitamin provides great energy from fermented sources. New Chapter Perfect Energy Multivitamin “is a whole-food fermented nutrient blend delivering 22 minerals and vitamins, and complementary herbs including maca, green tea, schizandra, turmeric, rhodiola, cardamom, and American ginseng,” per its official website. It also “converts proteins, fat, and carbohydrates into energy with eight fermented B vitamins, and supports mitochondria (the cellular powerhouses) in providing energy for daily activities or workouts,” per the same source. “Fermented” is the key word, folks. Any time your multivitamin has simpler components, the better – complicated ingredients make a supplement look artificial. We know y0u share the same sentiment. The first thing we look for in a multivitamin is an “ISO-Certified” or “All-Natural” seal of approval. Well, we found an “ICS Certified Organic” one on New Chapter Perfect Energy Multivitamin. ICS stands for “International Certification Services, Inc” – an organization which assures consumers their products meet the highest standards. “Our certification assures your customers that your organically-produced foods and ingredients meet a consistent set of National and International Organic standards,” per its official website. Honestly, we thought there are fillers in New Chapter Perfect Energy Multivitamin because of the insane number of ingredients (especially those under “Other Ingredients”). We’re glad this supplement’s “ICS Certified Organic” label will put our doubts to rest. We’re sure it will put you at ease, too. Whenever you’re keen on ramping up your energy levels, the first thing you should look for in a multivitamin is the amount of B vitamins. Long story short, these increase your energy levels and regulate heart health. Clearly, New Chapter Perfect Energy Multivitamin’s B vitamin levels are not on the same pedestal as the other two. Does this mean the former won’t give you ample amounts of energy? Six hundred percent of the daily value for thiamin or vitamin B1 is still solid, in our opinion. However, it’s not the amount which meets the standards of many hard-training athletes. Nonetheless, New Chapter Perfect Energy Multivitamin’s B vitamin content will still go a long way. When you check the other ingredient amounts, you won’t find anything out of the ordinary – you’ll see them in other leading multivitamin brands as well. As for us, we’re stoked New Chapter Perfect Energy Multivitamin has vitamin K, vitamin D3, chromium, and copper -three ingredients which some competitors overlook. Vitamin K helps promote healthy blood sugar levels, boost the immune system, and regulate blood clot formation. On the other hand, vitamin D3 helps improve heart health, ward off free radicals, strengthen bones, and regulate calcium and phosphate levels. For its part, chromium plays a key role in normal insulin function for more muscle mass and weight loss. Finally, copper helps boost immunity and iron absorption. So, not only these three important components fill your nutrition gaps, but they also make New Chapter Perfect Energy Multivitamin’s ingredient profile more comprehensive. Speaking of comprehensive, New Chapter Perfect Energy Blend’s Dynamic Energy Blend (322 milligrams per serving) makes it more powerful. Here, you’ll reap the full benefits of maca, schizandra, green tea, turmeric, ginseng, rhodiola, and cardamom. The upside: we’re confident these will help you kick your caffeine habit to the curb for good. The downside: the Dynamic Energy Blend is a shady proprietary blend. Boo. It would’ve been better – far better – if the manufacturer broke down the individual ingredient amounts. 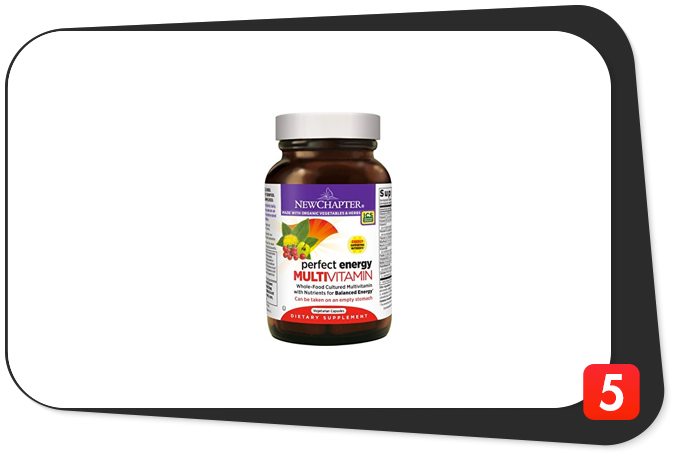 Nonetheless, we’re stoked this multivitamin has 300 milligrams of grape (seed) aqueous extract per serving. We say 300 milligrams per serving is optimal – you will enjoy grape seed extract’s full benefits, for sure. All in all, we’re confident New Chapter Perfect Energy Multivitamin will live up to its billing. It will provide you with great – not insane – amounts of energy which, in turn, will help you achieve your daily fitness goals and improve your overall quality of life. Vitamin A (100% as beta-carotene from culture media), 5,000 IU: This vitamin helps improve vision, strengthen bones, and ramp up muscle mass. Vitamin C (as ascorbic acid from culture media), 75 mg: A powerful antioxidant which helps keep free radicals at bay, improve cardiovascular health, boost vision, and produce collagen. Vitamin D3 (as cholecalciferol from culture media), 1,000 IU: A vitamin which helps strengthen bones, regulate heart health, keep free radicals at bay, and regulate calcium and phosphate levels. Vitamin E (as d-alpha-tocopheryl acetate from culture media), 1,000 IU: An ingredient which helps shorten exercise recovery time, ward off cataracts, and boost cardiovascular health. Vitamin K (as phylllquinone [K1] from culture media and as menaquinone-7 [K2] from natto), 80 mcg: This vitamin helps regulate blood sugar levels, immunity, and blood clot formation. Thiamin (as thiamine hydrochloride from culture media), 9 mg: Simply known as vitamin B1, this component helps shore up heart health and ramp up energy levels. Thiamin is also New Chapter Perfect Energy Multivitamin’s most abundant ingredient at an impressive 600 percent of the daily value. Riboflavin (from culture media), 10 mg: Vitamin B2 helps increase energy levels and boost the immune and digestive systems. An impressive 588 percent of the daily value for vitamin B2 ought to do the trick. Niacin (as niacinamide from culture media), 20 mg: A B vitamin which helps improve joint mobility and heart health. Vitamin B6 (as pyridoxine hydrochloride from culture media), 10 mg: This vitamin helps keep homocysteine levels (a non-protein amino acid detrimental to heart health) in check for better cardiovascular function. We’re sure 500 percent of the daily value will exceed expectations. Folate (as folic acid from culture media), 400 mcg: Simply known as vitamin B9, folate helps regulate cholesterol levels for improved heart health. Vitamin B12 (as cyanocobalamin from culture media), 30 mcg: Just like vitamin B1, vitamin B12 helps increase energy levels and boost cardiovascular health. Five hundred percent of the daily value for cyanocobalamin is a sure bet, folks. Biotin (from culture media), 300 mcg: Simply known as vitamin B7, biotin helps improve skin, nail, and heart health. It also helps keep inflammation at bay and repair muscle tissue. Pantothenic acid (as calcium d-pantothenate from culture media), 20 mg: Vitamin B5 helps ramp up stamina, improve heart health, boost the immune system, and keep stress levels in check. Calcium (from algae Lithothamnion [L. calcareum and L. corallioides]), 20 mg: New Chapter Perfect Energy Multivitamin is not a significant source of calcium at a paltry two percent of the daily value (five percent or less has a low value). Iodine (as potassium iodide from culture media), 90 mcg: An ingredient which helps regulate thyroid function and ward off bacteria. Zinc (as zinc oxide from culture media), 75 mg: Zinc is one of the most versatile minerals – it helps ramp up testosterone levels, improve sleep quality, regulate immunity, and ward off free radicals. Selenium (as selenium dioxide from culture media), 100 mcg: Selenium helps boost the immune system, keep free radicals at bay, and regulate thyroid hormone production. Copper (as copper sulfate anhydrous from culture media), 2 mg: A mineral which helps boost the immune system, increase iron absorption, and ward off free radicals. Manganese (as manganese chloride from culture media), 2 mg: This mineral helps regulate blood sugar levels, regulate metabolism and digestion, boost thyroid function, and stop inflammation and free radical activity dead in their tracks. Chromium (as chromium chloride from culture media), 120 mcg: This mineral helps regulate insulin function for increased muscle gains and fat loss. Molybdenum (as sodium molybdate from culture media), 10 mcg: An ingredient which helps ramp up energy levels and regulate the elimination of waste from the kidneys. Grape (seed) aqueous extract, 300 mg: Helps improve heart health, boost circulation, keep cholesterol levels in check, and ward off free radicals. Ginger (rhizome) hydroethanolic extract, 8 mg: Helps regulate digestion, boost immunity, promote healthy blood sugar levels, and keep free radicals and inflammation at bay. Organic ginger (rhizome) supercritical extract, 2 mg: Ginger is a flowering plant known for its powerful anti-inflammatory benefits. Organic maca (root) aqueous extract: A plant which ramps up endurance and immunity. It also helps improve bone and sexual health. Organic schizandra (berry) from culture media: A fruit which helps ward off inflammation, keep stress levels in check, and boost liver and digestive function. Organic green tea (leaf) aqueous extract: A popular beverage which helps enhance cognitive function, boost fat loss, keep free radicals at bay, improve heart health, and regulate blood sugar levels. Organic American ginseng (root) from culture media: A powerful herb which helps increase energy levels, promote healthy blood sugar levels, and improve neurological function. Organic turmeric (rhizome) powder from culture media: An Indian spice which helps keep free radicals at bay, ward off inflammation, detoxify the body, enhance cognitive function, boost heart health, and keep stress levels in check. Rhodiola (root) hydroethanolic extract: An adaptogen herb which helps torch fat, increase athletic performance, lower stress levels, and enhance cognitive abilities. Organic cardamom (seed) from culture media: Another Indian spice which helps shore up dental health, boost digestion, keep free radicals at bay, and slow down the aging process. Organic turmeric (rhizome) supercritical extract: A powerful Indian spice which helps ward off inflammation, improve heart health, and improve cognitive abilities. Well, if you need a multivitamin and energy booster, why waste your time and money buying two separate supplements? Enter New Chapter Perfect Energy Multivitamin. This is one of the best energy-boosting multivitamins we’ve seen to date. You can start with the solid B vitamin amounts for increased energy and better heart health. Granted, they’re not as much as those found in athlete multivitamins such as EFX Sports VitaDrive and Beverly International Super Pak, but they should do the job. In other words, New Chapter Perfect Energy Multivitamin is obviously not for professional athletes alluding to the lower B vitamin content. However, we say it’s perfect for the active individual. Let’s not forget the manufacturer harnesses the powers of fermented ingredients. These, combined with ICS Certified Organic certification, assures customers New Chapter Perfect Energy Multivitamin has no contaminants and fillers. Like we said, we also love the inclusions of underrated ingredients such as vitamin K, vitamin D3, chromium, and copper. Some manufacturers skip these components, but not the folks at New Chapter. That’s a good move – it made New Chapter Perfect Energy Multivitamin more powerful and comprehensive. We’re also stoked this product’s Dynamic Energy Blend packs a serious wallop. You can’t go wrong with time-tested ingredients such as Rhodiola rosea, turmeric, and green tea. With that, we’re confident the Dynamic Energy Blend will live up to its billing and then some. Plus, many customers swear by New Chapter Perfect Energy Multivitamin – they say it works. Period. Hold the applause for a minute, folks: this is not a perfect product. One glaring flaw is the proprietary nature of the Dynamic Energy Blend – the manufacturer fails to break down the individual ingredients. Finally, this multivitamin puts a strain on your wallet – one 72-tablet bottle costs $49.88. In sharp contrast, a 120-capsule bottle of the aforementioned EFX Sports VitaDrive – The King of B Vitamins – costs half the amount ($24.99). We’re guessing the fermentation process is the culprit here. Nevertheless, New Chapter Perfect Energy Multivitamin exceeded our expectations. This one’s a keeper, for sure. New Chapter Perfect Energy Multivitamin “converts proteins, fat, and carbohydrates into energy with eight fermented B vitamins, and supports mitochondria (the cellular powerhouses) in providing energy for daily activities or workouts,” per its official website. The manufacturer intended New Chapter Perfect Energy Multivitamin for healthy and active individuals who are at least 18 years of age who want to increase energy levels, achieve their daily fitness goals, and improve their overall quality of life. 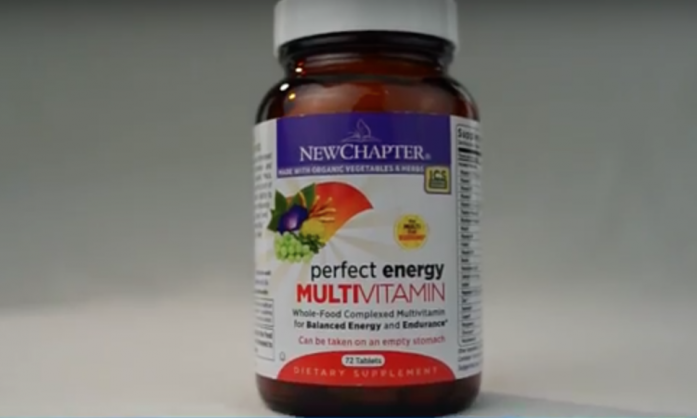 New Chapter Perfect Energy Multivitamin has 100 percent of the daily value for niacin of vitamin B3, an ingredient which may cause a burning sensation in the face and chest regions. If this, or any other ingredient, makes you feel doubtful, please consult your physician before buying New Chapter Perfect Energy Multivitamin. Impressive ingredients. Awesome from top to bottom. Solid B vitamin content. For increased energy levels and better heart health. Fermented ingredients. Meet the multivitamin with top-notch vitality and bioavailability. Has underrated ingredients. Vitamin K, vitamin D3, chromium, and copper, to be precise. Dynamic Energy Blend. Should live up to its billing. ICS Certification. Meets highest standards for organic supplements. Thumbs up. Clean ingredients. No fillers. Awesome. Great reputation. Customers swear by it. Proprietary blend. Company fails to break down individual ingredients of Dynamic Energy Blend. Boo. Take New Chapter Perfect Energy Multivitamin literally, folks. It should help increase your energy levels, fill those nutrition gaps, and achieve your fitness goals. It may not come cheap, but New Chapter Perfect Energy is worth every penny – we highly recommend you buy it.